Toyota Camry Rear Seat Room & Comfort Pros and Cons | Page 1 of 1 | Why Not This Car? What drives people to buy (or not buy) a certain car? 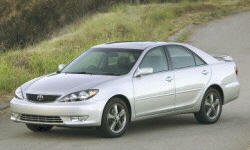 TrueDelta's members share Toyota Camry pros and cons based on their real-world driving experiences. Back in the day, Hondas weren't roomy by any absolute yardstick, but were surprisingly capacious considering their small exterior dimensions. Honda knew how to make the most of a small package. The Hyundai Sonata's real roominess story is in its back seat, where all but the largest adults will find plenty of space. There's about as much rear seat room in the Honda Accord, and nearly as much in the Toyota Camry, but considerably less in the Ford Fusion. Rear seat is large and lots of leg room. 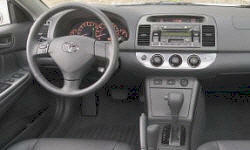 Nice feature is the center armrest, which many cars in this price range do not have. It could not seat three adults, while the Ford could easily seat three large people, and give them limo-like legroom.